Trisul 6.0 is a streaming distributed analytics platform. 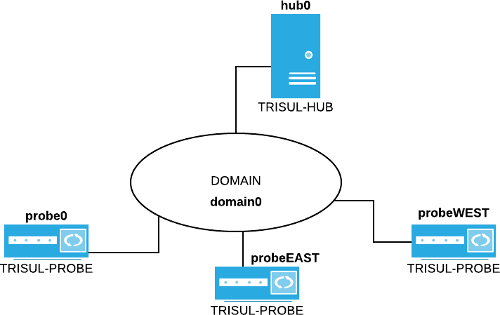 There are “Trisul Probes” which acquire and process network data and there are “Trisul Hubs” which provide the database function. The “Trisul Probes” are not just dumb collectors but actually contain the main streaming analytics function. You can even connect the output of a Trisul Probe to a separate backend like Elastic Search. The domain represents a top level management group within which you create a topology of probe nodes and hub nodes. All the nodes are logical entities and you can install them all on a single physical machine or distribute them on different machines. The following logical concepts are key to understanding a Trisul domain. Context – a separate monitoring instance. You always start, stop, and view data within a context. The topmost entity in Trisul called a domain. The default domain you are likely using is called domain0. A domain is a top level membership group which includes probes and hubs. Each probe and hub instance must belong to one and only one domain. You can also have multiple domains – each domain is disjoint from every other domain but the hardware can be shared. A context is a separate database that represents an instance of Trisul monitoring a particular network or dataset. You start and stop contexts as a unit. You also view reports and perform analytics within a context. By default Trisul puts all data into a single context called context0. You can create additional contexts using the trisulctl_hub tool. Profiles are just configuraton for probes inside of a context. Typically you would want each probe in a context to use the same profile. A profile includes such things as counter groups, thresholds, flow trackers, and the other things that you would find when you login as Admin > Admin. A probe can run in multiple contexts and multiple domains. There will be different instances of the probes running isolated from each other. Probes transform packets into analytics streams. Hubs provides the database and querying functionality. Data from all the Probes stream into to a Hub and are stored here. The only data that stays on the Probe are the raw packets. Packages The package “trisul-hub” provides the Hub function. The package “webtrisul” which resides on the same node provides the webserver. The authentication used to connect various nodes to the domain is ZeroMQ CURVE security using certificates. CURVE uses elliptic curve encryption and cryptography. See CurveMQ for more.